Reis, C., Pernencar, C., Carvalho, M., Gaspar, P., Sousa, P., Martinho, R., Frontini, R., & Alves, R. (2019). TeenPower: development of an adolescent obesity prevention platform using an user-centered design approach. JMIR mHealth and uHealth, online first. Sousa, P., & Frontini, R. (Eds.) (2019, in press). 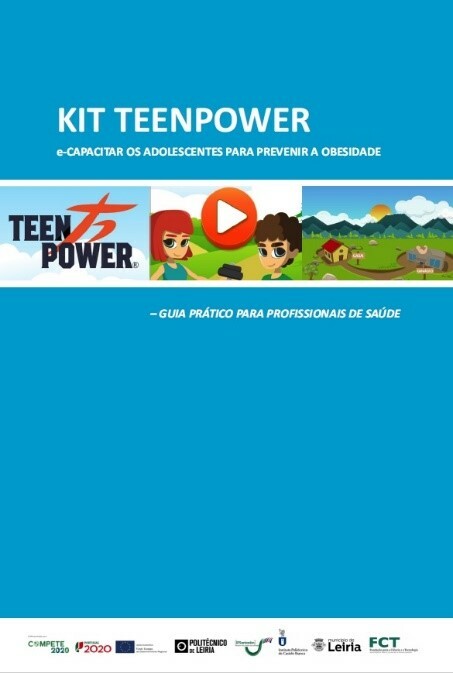 Kit TeenPower: e-capacitar os adolescentes para prevenir a obesidade – Guia prático para profissionais de saúde. Instituto Politécnico de Leiria. Sousa, P. (Ed.). (2019, in press). Tecnologia & Inovação na promoção de comportamentos saudáveis em adolescentes. Coimbra: Grácio Editor. Paulo, R., Honório, S., Rocha, R., Pimenta, N., Morouço, P., Sousa, P., Frontini R. (2019, in press). Plataforma interativa interdisciplinar para promoção de comportamentos saudáveis, prevenção do sendentarismo e da obesidade (TeenPower). in Livro do Fórum REDESPP – DESPORTO. Alves, R., Carvalho, M., & Reis, C. I. (2019). TeenPower: Measuring the effectiveness of an intervention program and encourage adolescents towards physical activities using gamification. Proceedings of the 6th ENBENG 2019: 1-4. Carvalho, M., Alves, R., & Reis, C. I. (2019). TeenPower: A new obesity prevention strategy to e-empower and engage teenagers through gamification techniques applied to a self-monitoring mobile application. Proceedings of the 6th ENBENG 2019: 1-4. Carvalho, M., Alves, R., Reis, C., Martinho, R., Sousa, P., Gaspar, P. (2019). Teenpower: an integrated architecture for an mHealth platform designed for e-Empowering teenagers to prevent obesity: A showcase of the TeenPower platform. Proceedings of IEEE 20th International Conference on e-Health Networking, Applications and Services (Healthcom): 1-4. Pernencar, C., Sousa, P., Frontini, R., Martinho, R., Runte, D., Mendes, D., & Carvalho, M. (2018). Planning a health promotion program: Mobile app gamification as a tool to engage adolescents. Procedia Computer Science, 138: 113–118. Sousa, P., Frontini, R., Carvalho, M., & Alves, R. (2018). Teenpower: An interdisciplinary game-based mHealth system to empower adolescents towards obesity prevention. Proceedings of Academics World International Conference: 1-5. Sousa, P. (2018). TeenPower: e-Empowering teenagers to prevent obesity. BMC Health Services Research, 18(Suppl 2):4. doi.org/10.1186/s12913-018-3444-8. Luís, L., Frontini, R., Sousa, P., Teles, D., Ribas, D., Sousa, V., & Martins, J. (2018). Nutritional Behaviours of Portuguese Adolescents Integrated in an E-Health Intervention Program (TeenPower). 3rd International Conference Biomedical and Social Sciences: Education, Research and Innovation 2018 Abstract Book. Frontini, R., Sousa, P., Gaspar, P., Ferreira, M. & Duarte, E. (2018). Tecnologias mobile na promoção da saúde: Abordagens teóricas do projeto TeenPower. VII Conferência Internacional de Investigação, Práticas e Contextos em Educação (IPCE) Abstract Book. Paulo, R., Honório, S., Duarte, E., & Sousa, P. (2018). TeenPower: Designing a mHealth intervention program to promote healthy beahaviors and prevent obesity. XIV SIEFLAS – Seminário Internacional de Educação Física, Lazer e Saúde Abstract Book. Paulo, R., Honório, S., Rocha, R., Pimenta, N., Morouço, P., Sousa, P. (2018). TeenPower: Programa interdisciplinar com utilização de plataforma interativa, para promoção de comportamentos saudáveis e prevenção do sendentarismo e da obesidade. Livro de Atas do 2.º Fórum REDESPP – DESPORTO Abstract Book. Alves, R. (2019, em curso). Teenpower Backoffice – A Content Management System For Delivering Health Related Content And A Context Aware Gaming Platform For Providing Location Based Challenges (Dissertação de mestrado). Instituto Politécnico de Leiria. Carvalho, M. (2019, em curso). TeenPower mobile – e-empowering teenagers through a self-monitoring app as an obesity prevention strategy (Dissertação de mestrado). Instituto Politécnico de Leiria. Ferreira, I., Filipe, M., Guerra, P., & Ferreira, R. (2019, em curso). 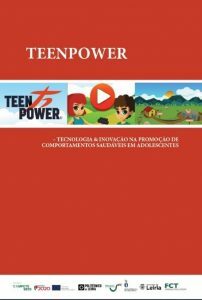 Aceitação do programa e-terapêutico TeenPower: prevenção da obesidade na adolescência e promoção de comportamentos saudáveis (Trabalho final de curso). Instituto Politécnico de Leiria. Alves, R., Carvalho, M., & Reis, C.I. (2019). TeenPower: Measuring the effectiveness of an intervention program and encourage adolescents towards physical activities using gamification. Comunicação oral apresentada no 6th ENBENG 2019. Bengala, M. E., Honório, S., Crisóstomo, R., & Paulo, R. (2018). E-capacitar os adolescentes para prevenir a obesidade (TeenPower). Comunicação oral apresentada nas IV Jornadas do Potencial Técnico e Científico do IPCB, Castelo Branco, Portugal. Carvalho, M., Alves, R., & Reis, C. I. (2019). TeenPower: A new obesity prevention strategy to e-empower and engage teenagers through gamification techniques applied to a self-monitoring mobile application. Comunicação apresentada no 6th ENBENG 2019. Frontini, R., Sousa, P., Gaspar, P., Ferreira, M. & Duarte, E. (2018). Tecnologias mobile na promoção da saúde: Abordagens teóricas do projeto TeenPower. Comunicação oral apresentada na VII Conferência Internacional de Investigação, Práticas e Contextos em Educação (IPCE), Leiria, Portugal. Frontini, R., Sousa, P., Carvalho, M., Alves, R., Ferreira, R., & Figueiredo, M. C. (2019). A mobile-based monitoring sleep system integrated in a mHealth program. Comunicação oral apresentada no Annual Meeting 2019, Coimbra, Portugal. Frontini, R., & Sousa, P. (2019). Exploring healthcare professionals’ acceptance towards ICT-based interventions for health promotion: A mixed-methods approach. Comunicação oral apresentada no Annual Meeting 2019, Coimbra, Portugal. Luís, L., Frontini, R., Sousa, P., Teles, D., Ribas, D., Sousa, V., & Martins, J. (2018). Nutritional Behaviours of Portuguese Adolescents Integrated in an E-Health Intervention Program (TeenPower). Comunicação oral apresentada na 3rd International Conference Biomedical and Social Sciences: Education, Research and Innovation 2018, Klaipeda, Lithuania. Paulo, R., Honório, S., Duarte, M. E., & Sousa, P. (2018). TeenPower: designing a mHealth intervention program to promote healthy behaviors and prevent obesity. Comunicação oral apresentada no XIV Seminário Internacional de Educação Física, Lazer e Saúde (SIEFLAS), Brasil. Paulo, R., Honório, S., Rocha, R., Pimenta, N., Morouço, P., Sousa, P. (2018). TeenPower: Programa interdisciplinar com utilização de plataforma interativa, para promoção de comportamentos saudáveis e prevenção do sendentarismo e da obesidade. 2.º Fórum REDESPP – DESPORTO. Pernencar, C., Sousa, P., Frontini, R., Martinho, R., Runte, D., Mendes, D., & Carvalho, M. (2018). Planning a health promotion program: Mobile app gamification as a tool to engage adolescents. Comunicação apresentada no Hcist 2018. Sousa, P., & Equipa TeenPower (2018). Project TeenPower: e-Empowering teenagers to prevent obesity. Comunicação oral apresentada no 4th Health International Congress of IPLeiria, Leiria, Portugal. Sousa, P., Frontini, R., Carvalho, M., & Alves, R. (2018). TeenPower: An interdisciplinary game-based mHealth system to empower adolescents towards obesity prevention. Comunicação oral apresentada no Academics World International Conference, Venice, Italy. Sousa, P., Frontini, R., Luís, L., Carvalho, M., & Alves, R. (2019). A mobile-based food diversity monitoring system for promoting healthy dietary habits. Comunicação oral apresentada no Annual Meeting 2019, Coimbra, Portugal. Sousa, P., Frontini, R., Luís, L., & Ferreira, R. (2019). The relationship between eHealth literacy and adolescents’ food choices. Comunicação oral apresentada no Annual Meeting 2019, Coimbra, Portugal. Carvalho, M., Alves, R., Reis, C., Martinho, R., Sousa, P., & Gaspar, P. (2018). Integrated Architecture for a mHealth Platform designed for e-Empowering teenagers to prevent obesity (TeenPower). Poster apresentado no 2018 IEEE 20th International Conference on e-Health Networking, Applications and Services (Healthcom), Ostrava, Czech Republic. Frontini, R., Sousa, P., Luz R., Duarte, A., Sismeiro, B., Moreira, M. & Machado, R. (2018). Assessing digital content in the TeenPower project: Development and validation of a questionnaire. Poster apresentado na no 4th Health International Congress of IPLeiria, Leiria, Portugal. Luz, R., Frontini, R., Sousa, P., Abreu, R., Pozo, T. … & Ruivo, M. (2018). Assessing digital contents for health promotion and obesity prevention in adolescence. Poster apresentado no 4th Health International Congress of IPLeiria, Leiria, Portugal. Sousa, P., Frontini, R., Dixe, M. A., Ferreira, R., Figueiredo, M. C. (2018). Assessing preferences and features for a mobile app to promote healthy behaviors in adolescence: An exploratory study.Poster apresentado no 4th Health International Congress of IPLeiria, Leiria, Portugal.